Following the defeat of a vote in the US Senate to debate ending the US army’s Don’t ask, Don’t tell’ policy, the British army claims that allowing gay and lesbians to openly served has improved the armed forces. Last week, primarily Republican US senators voted to block a debate into gay and lesbian people being able to serve openly in the military. A minimum of 60 senators were required to be in favour of overturning a filibuster of the ‘defence authorisation bill’ which includes the repeal of the US military ‘Don’t ask, Don’t tell’ policy by senator John McCain but only 56 senators voted in favour. Although some of the senators who voted against did so because of an immigration amendment ‘tacked’ onto the bill. The vote came after a high-profile campaign by the singer Lady Gaga which included her wearing a dress made from meat at the MTV Video Music Awards and posting a video message to YouTube where she appealed directly to a number of Republican senators to support the vote for a debate and ultimately to repeal the ‘Don’t Ask, Don’t Tell’ policy. He added: “We got to the point where the policy was incompatible with military service and there was a lack of logic and evidence to support it. 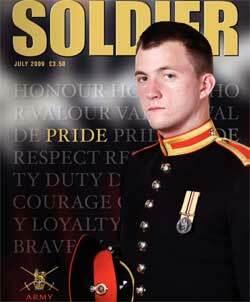 Last year, Soldier – the magazine of the British army – featured a gay serviceman on its cover for the first time, honouring ten years of gay and lesbian soldiers serving openly in the army. Trooper James Wharton, of the Household Cavalry Regiment, is shown wearing dress uniform complete with an Iraq medal. He appears on the cover next to the slogan ‘Pride’.